Visual Media Specialist Stacy Niedzwiecki offers innovative design solutions for a wide variety of clients. Her areas of expertise are reflected in a portfolio of logos, brochures, fliers, advertisements, newsletters and event promotion materials. In addition to traditional design projects, she also serves as webmaster for a number of organizations. Although her core skills remain focused on graphic design and layout, Stacy now leverages her talents in digital travel and nature photography. Her fascination with nature’s beauty has found its way through the camera lens, earning awards in many art and photography competitions. Her work has been featured in the Michigan 24/7 photography book, Whisper in the Woods Nature Journal, the Rockford Squire newspaper, Michigan Blue, Michigan History, and Tasters Guild Journal magazines, and the Explore St. Louis Official Visitors’ Guide. In August of 2009, Niedzwiecki was awarded second place in the Pure Michigan Photo Competition, a highly-competitive event sponsored through Travel Michigan, (a division of the Michigan Economic Development Corporation) the State of Michigan’s official agency for the promotion of tourism. The images Niedzwiecki captured for the Muskegon County CVB are showcased the book Pure Michigan: Abundant Natural Beauty, Authentic Destinations, Unique Experiences: Spring. Two of Stacy’s artworks were selected to hang on display at the Governor Jennifer Granholm’s Residence in Lansing as part of the Governor’s Residence Michigan Artists Program from July 2008 through July 2009. 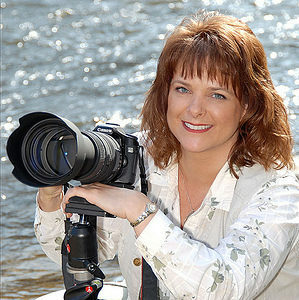 Her most honored accomplishment is the installation of 63 of her nature images at the permanent art collection in the new Lemmen-Holton Cancer Pavilion, which opened June 30, 2008 in Grand Rapids, Michigan. These images are showcased in her first book effort, Healing Images – A Selection from the Lemmen-Holton Cancer Pavilion which was released in March 2010. Since the summer of 2013, Stacy’s artwork has been on display at the Lake Express, a high-speed ferry service providing service across Lake Michigan between Muskegon, Michigan and Milwaukee, Wisconsin. Her fine-art canvas pieces are on display throughout the Muskegon terminal building. For more information, please contact the artist at info@stacyn.com.